(ThyBlackMan.com) WE, who have an unwavering interest in this issue want to STOP the killings, of American citizens. 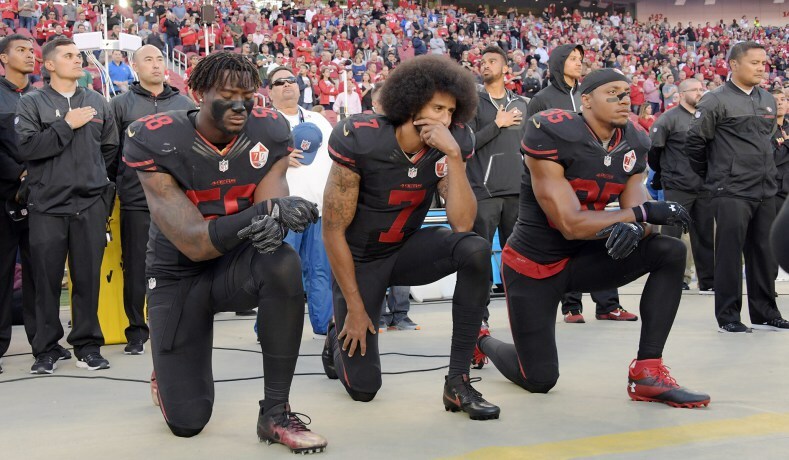 What has been lost, in the recent main street media discussions regarding the edict issued to professional football players of the National Football League(NFL), requiring them to stand, while the National Anthem is being played, if they are on the field, or be fined, is the discussion about solutions. President Trump knew his racist bomb would break the league up into opposing factions because of the issue and the employee make-up of the NFL; 70 percent African American(AA). The issue of blacks dying at the hands of those who represent law enforcement presupposed this outcome. Even a novice political analyst could predict at the beginning of this argument, pitting patriotism against police misconduct, was going to clearly put NFL owners at odds with its AA players work force. 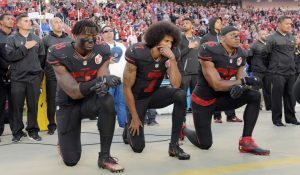 The NFL owners, because of Mr. Trump’s comments, have now publicly expressed their position on whether players will be able to continue to practice their First Amendment right of protest against police misconduct in the killing of African Americans by kneeling, during the playing of the National Anthem. Protesting NFL players are not the only ones, however, looking for an answer to these questionable killings, by police and their proxies. The African American community, the vast majority of law enforcement, prosecutors and many in the white community would like to see solutions to these killings, also. That is what the objective of the kneeling should have been about, and not about the players themselves. The NFL owners in stating their edict, also said that they have awarded $90,000,000.00 to the NFL Players Association (NFLPA), to pursuit their civil rights agenda. It boggles the mind of anyone, who has a vested interest in seeing a solution to these killings, why NFL players through their union aren’t demanding, that the players’ union use part of that capital to sponsor a summit of stakeholders. The solution to this problem lies in sending errant officers and proxies of the state to prison for these killings, in an attempt to correct the poor hiring decisions made, by police departments personnel offices, who select people, who are not well suited for that occupation. The shooting of unarmed blacks can be reduced drastically or resolved, just like the lynchings of African Americans were resolved through successfully prosecuting the perpetrators. African Americans would like to see these prosecutions happen more often. NFLPA can take the obvious step and bring stakeholders from around the country together. They can identify and bring the chiefs or department heads of perhaps 15 police departments, who are interested in coming up with solutions, that will lead to less of these types of killings together and sit them down around a conference table. And over a twelve month period, having perhaps 2 to 3 hour meetings each month, ask these chiefs or department heads of these law enforcement agencies to come up with a guide that they feel will be effective in bringing down the number of these types of shootings or perhaps eliminate them all together. A good starting point for a discussion might be, how do you recruit and retain good police officers? Additionally, other points of discussion and debate could be: Are there any tests out there that have been administered that have actually been found to work when it comes to the search for good police officers? What are the best practices, when it comes to how to remove police officers, who are found to be “bad apples,” from the ranks of these police departments? What are the best courses of action when it comes to dealing with police unions and the removal of bad police officers? How do you get fellow officers to bring to management’s attention bad officers who should not be carrying a badge and a gun? The above are just a few suggestive topics that can be discussed, debated, and covered in an attempt to arrive at solutions, when it comes to law enforcement and the shootings we have experienced, when it comes to African Americans. When it comes to prosecutors, because this is such an important part, in finding solutions to the problem of AA deaths (and other citizens) at the hand of law enforcement; the black community and others would like to see “more convictions.” Again, simultaneously over the same twelve month period, having perhaps 2 to 3 hour meetings each month in a different or separate conference room, prosecutors can examine and look at many of these cases in detail. It could help them determine why many of these cases are lost. Of course, doing this will help in future prosecutions of errant law enforcement officers. A suggestive roster for such a conference, and by no means, these are not the only prosecuting teams, who should be in attendance, are the prosecuting teams of Jacksonville, Florida (who prosecuted George Zimmerman), Tulsa, Oklahoma (who prosecuted Betty Shelby), Baltimore, Maryland (who prosecuted officers in Freddie Gray’s death ) and Detroit, Michigan (who prosecuted the killer of Renisha McBride successfully). The union should give them all the material support they need and even bring in expert speakers to look at and examine, why so many of these cases are lost. The objective here would be, once a consensus is reached among these talented individuals, to make their findings available to prosecuting teams and police departments across the country. NFLPA can take the opportunity, with the money owners have given them, and bring these stakeholders together and sit them down around a conference table and debate, argue, research and talk about, how we can get solutions to this dilemma. Mr. Trump with his divisive comments, chose to divide America along racial lines, however the NFL and NFLPA, if they choose to do so, can rise above these divisive comments and bring much needed healing to our nation, by sponsoring conferences of these stakeholders. NFL athletes can then stand down, as the conferences of these stakeholders work toward the solutions, I have mentioned above. They are well regarded by many people, including myself, for having the courage to highlight this issue. And by doing this, the NFL and the NFLPA will be looked upon as organizations that not only work in their own best interest (after all it is an entertainment business), but in the best interest of the communities, with which they do business. They can take advantage of their handling of this issue, which threatened to divide the league as an organization and now use it to improve their brand. We are the United States of America. I want to believe we are a God loving nation of people of solutions. To the NFL owners and the players union, don’t miss this great opportunity! In the final analysis, the most prominent of the stakeholders in this vexing issue are all the American people and the democratic principles of justice we value so highly. There is something happening here; and now at last, you, yes you, can seriously help stop the killings of African Americans. Tweet the NFLPA @ https://twitter.com/NFLPA by the hundreds and ask them why they have yet, to use the money owners have given them (90 million dollars) to sponsor a meeting of stakeholders.